I’m just back from another fantastic charter aboard Dewi Nusantara, around some of Indonesia’s best dive spots. Like the previous trip, we visited some of our favourite sites in Alor but this time we then headed north to finish up in the Wakatobi chain of islands. I have a long history with Wakatobi and was very excited to be back diving the area’s fantastic reefs. If you missed my last trip report, I ran this and the previous charter as part of a new venture alongside Wendy Brown. Together, Wendy and I make up ‘Our Beloved Seas’, leading scuba diving expeditions for divers interested in learning more about marine life and exploring some of the best dives the oceans have to offer. Wendy has spent the last decade diving around Indonesia, firstly with Wakatobi Dive Resort and then as cruise director of Dewi Nusantara. With unrivalled knowledge of the country’s dive sites, she gets us to the best places to explore the region’s diversity. Meanwhile, I give marine life talks so our guests can learn about the amazing creatures and ecosystems we encounter along the way whilst also hunting for rare, strange and endemic fishes (those on my previous trips will know how much I love an endemic, or indigenous creature). Together our knowledge and experiences place our guests in the best locations to experience some of the world’s best diving. Wendy and I are both passionate conservationists, and for each of our trips we donate a percentage of the proceeds to a different conservation organisation. For these two trips we chose to support ‘Save our Seas Foundation’, who do fantastic work through the funding of conservation, education and research projects around the world. In the Coral Triangle region they fund projects that work to reduce destructive fishing techniques, as well as the protection of marine megafauna such as sharks, turtles and mantas. More specifically, around Indonesia they have a major project conserving and researching the magnificent manta ray and the fisheries targeting them in Bali, Komodo and Raja Ampat. If you’re interested learning more about them, please visit www.SaveOurSeas.com. After an all too long hiatus from diving in Alor, which until this year I hadn’t visited since 2008, I was pleased to be back for the fourth time in six months! I’m a firm believer that the more you dive a site, atoll, island or country the more you get out of it and the more you ultimately see. Even after so many repeated visits to Alor, we still saw plenty of new critters and behaviours to get excited about on this fourth trip. My favourite fish from the Alor area is definitely the stunning Humann’s fairy wrasse (Cirrhilabrus humanni). Despite an exhaustive search, and being blessed with the humanni eye, I couldn’t find this little beauty on the previous trip. Thankfully, within two minutes of descending on a dive in the Pantar Strait, I spotted a displaying male. These fish are one of the most challenging to photograph that I’ve ever encountered. Unlike many other male fairy wrasses, the Humann’s doesn’t display only in the water column above his small harem. Instead, he dashes around the reef, swimming many metres from one female to another in a matter of seconds. Reaching a maximum length of 7 cm only compounds the difficulty in spotting and photographing the elusive fish. My technique to point him out to the guests was call and grunt my signature noise as loudly as I could and continually point at him as he sped around. I couldn’t take my eyes off him for even one second for fear of loosing him amongst the throngs of Javanese fairy and various flasher wrasses. Several people did manage to pick him out from the crowd, but his similarity to the more abundant Javanese fairy wrasses wasn’t helpful. As the rest of the group headed off in search of Rhinopias, I spent the rest of the dive attempting the photograph the Humann’s. After half an hour I’d finally figured out that my best bet was to stalk the cleaning station that he visited every ten minutes or so and hope to capture an image there. After a couple of frustrating missed shots, I waited another twenty minutes and got the shot I was after during one of his ablution stops. I was very happy with the shot, although sad to have missed the Rhinopias that the others found. After a few days around Alor it was time to begin our journey north towards Wakatobi. However, we were first due a stop at the volcano of Kumba, which was located perfectly en route. Every one of the four visits I’ve made to the volcano has been different. Some have had more boom, others were smokier, but this time there was much more lava than previously. We arrived at the remote volcano just as a great cloud of smoke bellowed from the top of the island. As the sun set, ambient light gave way to a glow from the crater. Every fifteen to twenty minutes glowing embers of lava were sent flying from within, followed by an ear splitting resonant boom. Some lava was sent so high it cleared the crater and started a fire on a hill the other side. This must be relatively frequent an occurrence, since a clearly defined tree line was visible where nothing but dead trunks remained. The last eruption before we went on our way, gave the greatest show. Being pitch dark by this point we could hardly make out the plumes of smoke, but couldn’t miss the noise of the eruption. This was easily the most dazzling eruption I’ve seen so far. Glowing lava covered the slopes behind the crater and rivers of smouldering boulders tumbled down the hill towards the ocean. When they eventually reached the water in an enormous splash, you could hear the crack of cool water being vaporised by the intense heat of the rocks. I have a long history with the Wakatobi region. I initially visited the area in 1998, on my first ever trip to Indonesia, where I spent four months volunteering for a conservation organisation cataloguing the nudibranch (sea slug) species diversity. Ten years on and I spent six months at Wakatobi Dive Resort for much of the fieldwork for my PhD research on the biology and conservation of pygmy seahorses. With additional dive trips in between I’ve spent almost a year exploring this biologically rich region and was very excited to be heading back again. I always find that each area I visit has certain characteristic creatures that are unusually common or memorable. There are several of these around Wakatobi (apart from the pygmies obviously) and one of my favourites is the halimeda ghost pipefish. On arrival in the Wakatobi region our first stop was at Binongko Island, which I had never visited before. After my initial shock at the 24˚C water, I was quickly distracted by a pair of these lime green syngnathids that I had found living in a patch of algae. The male looked to have recently settled from its planktonic stage, still possessing long filaments on the dorsal fin. Both the male and female however were covered in the lovely red filaments that make these fish so photogenic. Over the coming days we revisited the favourite reefs of myself, Wendy and Yann around Wakatobi Dive Resort. After this we headed to our final destination of the trip, the large bay around Pasarwajo on the island of Buton, just off the southeastern Sulawesi mainland. This area is well known for its muck diving and we were all excited to be back on the typical sandy slopes of this kind of diving. We visited the famous sites of Cheeky Beach, Asphalt Pier, New Pier and Mandarin Pier with outstanding sightings. Cheeky Beach in particular was absolutely on fire. The list of treasures from all the guests, Wendy, the four guides and myself was amazing, and definitely rivalled Lembeh Strait in richness. The most unexpected find was a stunning little paddle-flap scorpionfish (Rhinopias eschmeyeri) hidden amongst the orange algae. In addition, we had many wish-list critters including blue-ring and poison ocellate octopus, Coleman shrimp, various ghost pipefishes, seahorses, seamoths and a Spanish dancer nudibranch. This list isn’t even doing the amazing biodiversity full justice. 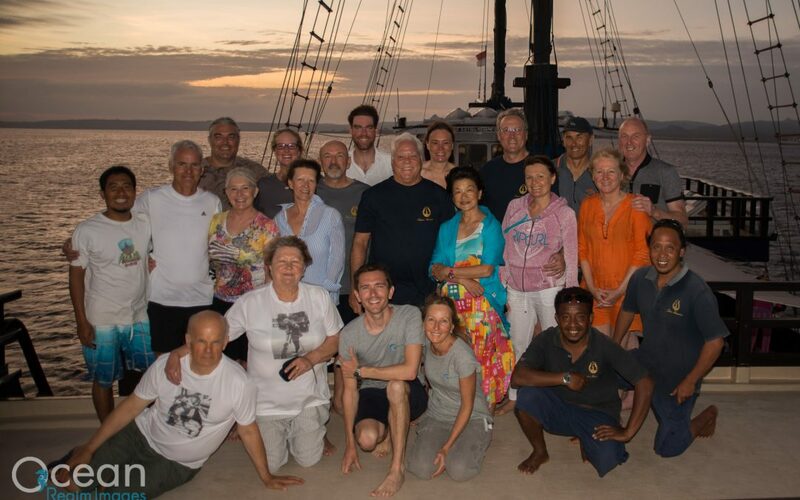 It was fantastic to finish the Our Beloved Seas trips on such a high note! The last night is always a double-edged sword, having the fun photo share but also the ominous spectre of packing. We had an exceedingly high calibre of submissions in the photo share on this trip, and I was really pleased to see so many behaviour shots. Behaviour shots are always my favourite, which is why one of my talks is dedicated to them. The popular vote was again very tight, but ultimately it was a full house for David Dempsey who again took home the prize for the best shot. He had a stunning image of a scorpionfish eating a shrimp taken at night in Beangabang Bay (I’m still kicking myself for missing that dive, I should have known better!). To see some of my images from the trip, please follow this link to my Alor to Wakatobi | August 2014 album. FOLLOW UP FROM MY LAST TRIP REPORT | In my previous blog, I posted a shot of the wobbegong shark we found and were unable to identify. I contacted a friend who specialises in wobbegongs and who’s described a couple of southeast Asian species himself. He believes our shark from Alor is Orectolobus leptolineatus, which he described in 2010, and if so, it is one of only a few live examples ever seen and photographed. We seem to have made a habit of seeing super-rare creatures on our trip. This was certainly the aim of the ‘Our Beloved Seas’ union and long may it continue through working together, in addition to conserving these amazing oceans of ours.